As a sci-fi writer it stands to reason that I’m an avid sci-fi reader. However, last night as I was reading “The Gods of Mars“ by Edgar Rice Burroughs, I found myself rushing through some of the descriptive scenes. Suddenly, I felt as if I were locked in a totally dark room, while choking and in desperate need of air. Now please understand that this is not meant as a disparaging remark against Mr. Burroughs. I actually find his writing to be fun and adventurous. 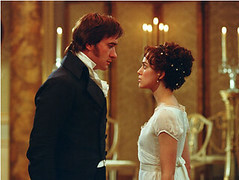 “Pride and Prejudice“ and read the first chapter. A sigh of relief escaped my lips as continued reading gave me the feeling of being wrapped up in my favorite olive green blanket while sitting in front of a toasty warm fire and sipping hot cocoa. While we writers need to make sure we are reading our genre, we also need to allow for a bit of eclectic reading. It wasn’t just the enjoyment of reading that was growing stale. I noticed that my writing was as well. I kept looking at my first draft and wondering what was missing. I have planets, ships, aliens, alien language and foods, plenty of conflict and a few explosions. However, I was missing the balance of positive emotional and human experiences. Beauty and levity are missing from my novel. Of course, since I’m still in the first draft stage, it’s easily fixed. I find that by choosing to limit what I read, I am choosing to limit my experiences. In limiting said experiences, I limit what I can contribute to to world as a whole. My grandpappa, Allan Horwitz, used to always tell me that whatever career I chose in life, make sure it was something that contributed to the world in a positive manner. I strive to do that with my writing. Reading other genres, I find, is a healthy way of making sure that I, as a writer, am more well-rounded in my storytelling. During my childhood, my parents made sure that my brothers and I were exposed to various types of music, movies, books and life experiences. By doing this, they ensured that their children wouldn’t grow up to be stereotypical individuals. We are more likely to see things from various points of view and not just from the “black” or “feminine” or “masculine” stance. Writers, while we do have our individual outlook on things, need to be relate-able to our readers. As a sci-fi writer, I don’t want to just attract sci-fi readers; I want to attract someone who would normally only read a murder mystery twice a year. To do that, I need to be able to write aspects of fiction that would entice a more diverse audience. Now why is that important for a writer? Why can’t we just have all Romance fans if we’re a romance writer? Simple, if you want to really sell books and retain fans who are going to be instrumental in the “word-of-mouth” marketing that we all need to have a measure of success, then you want to purpose to write a book that will have a little something for almost everyone. To do that, you need to incorporate elements of different genres in your storytelling. Think about it. If someone who only eats Southern food suddenly tries Thai food and loves it, you’re probably going to try Thai food, too if they suggest it. Same with readers. If I’m a sci-fi fan and everyone knows it, then I suggest a murder mystery and say it’s really awesome, then my friends will probably take my suggestion to read it. The suggestion is outside of my norm. If someone goes outside of their comfort zone, tries and likes something, that’s a big deal. Some of the best books I’ve ever read, while they may have been one specific genre or other, had other elements involved. Novels such as “A Brave New World“, “The Count of Monte Cristo“, “Ender’s Game“, and “Peter Pan“, each incorporate elements of mystery, drama and romance; however their main genres are sci-fi, historical, sci-fi and fantasy respectively. I’m not saying that when you’re done you won’t be able to figure out which genre our book belongs in. I am saying that a really great story has many different elements to keep the reader happily enticed and far from bored. So I think I’ll finish reading “Pride and Prejudice” then read a little Shakespeare and then go back to Mars. And in the meantime, I’ll add a bit of beauty and humor to my novel.